A few years ago I bought a laser printer and at some point, when the printer was still a new thing and I was trying all kinds of things with it, I decided to push the limits of how small could text get while still being visible. I stress visible because I wasn’t aiming for readability, which goes out the window when the text size goes below 7 or 8 points. What I wanted was to test the printer’s ability to draw distinguishable text. Having to use a microscope to read the text was not only acceptable, it was desired! 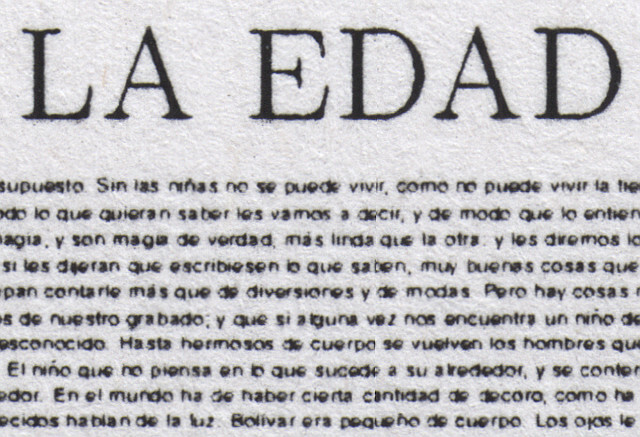 “La Edad de Oro” in one page and a close-up at the right. To check the limits of my printer’s resolution, I started simply by writing some random text and giving it increasingly smaller point sizes in OpenOffice’s Writer. The results weren’t interesting because they looked just like a very fine gray line on the page. So I thought “what if I cram a lot of text in one page”. My first candidate was the GNU General Public License v3 which spanned 12 letter pages at the default font size in OpenOffice. But after stripping all redundant space I realized it fit one page using a text size of just 4.5 points, even with generous margins. Not impressive at all. I then tried with Romeo & Juliet, which I had downloaded from Project Guttenberg. After removing all redundant whitespace it spanned 29 pages at the default font size in OpenOffice. 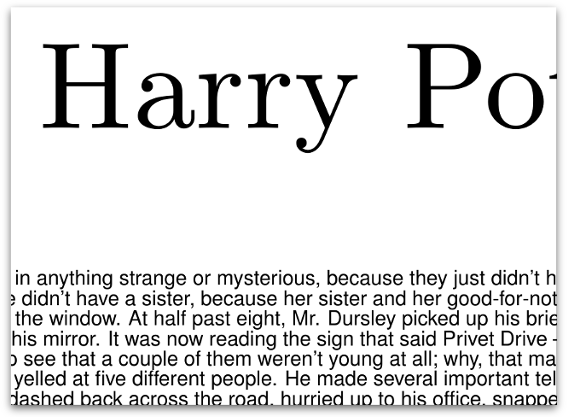 Using a proportional typeface at 2.3pts fit all the text in one page, but OpenOffice was already bursting at the seams. Romeo & Juliet in one page already had a nice ring to it, so I told my friends at that point. And one of them, Yuri Quintana, said “could you do it with La Edad de Oro?”. I outright said no. Romeo & Juliet was a thin, maybe 5mm book, while La Edad de Oro was a book with more than 1cm of thickness. In any case I tried. I looked it up on the Internet. Being over 120 years old, there was no copyright to worry about and I found it in its entirety at www.damisela.com. Curious aside: La Edad de Oro started as a children’s magazine, and it came out in New York the same year that the Nintendo Playing Cards Company was founded on Kyoto, Japan. Yes, Nintendo is 127 years old. Now, fitting La Edad de Oro in one page became more of a challenge. OpenOffice broke down quickly. I was trying to put more than 66'000 words in a single paragraph and it couldn’t cope with it. When it didn’t crash, it became so slow I struggled to even change the margins. So I moved to LaTeX. LaTeX wasn’t happy either at first with such small text sizes. But with a couple of font packages I managed to do it. The .tex file is here, in case you want to reproduce it yourself. You’ll need texlive-lang-greek, because I included a capital delta letter at the end. At that size, the whole book is just one 422 lines-long paragraph with an average of 158 words per line. 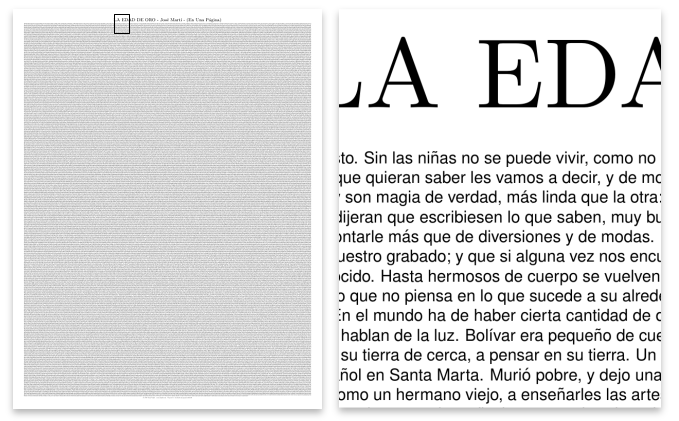 In fact, the poem “La perla de la mora” occupies just one line in the middle of the page.